Still's disease is a serious disease, manifested by fever, polyarthritis. It is manifested by rashes on the skin and a systemic inflammatory lesion of somatic organs. Still's disease is diagnosed using a method of excluding other diseases based on clinical symptoms, laboratory data, the results of the study of affected joints, lymphoreticular and cardiopulmonary system. The treatment of the Still's disease is carried out mainly with non-steroidal anti-inflammatory and glucocorticoid drugs, cytostatics are the reserve drugs. Still's disease was described as early as 1897 by the British doctor George Still. For a long time, it was considered a severe form of juvenile form of rheumatoid arthritis. Only in 1971, Eric Bywaters, published numerous observations of this disease in adult patients. According to statistics, which leads modern rheumatology, the prevalence of the disease Still in recent years is about 1 person per 100 thousand of the population. Women and men are equally susceptible to morbidity. The greatest number of cases of Still's disease occurs in children under the age of 16 years. Numerous studies in the field of etiology of Still's disease did not give an answer to the question of its causes. Sudden onset, high fever, lymphadenopathy and blood leukocytosis indicate the infectious nature of the disease. However, a single causative agent has not yet been identified. In some cases of Still's disease, rubella virus was detected in patients, in others - cytomegalovirus. There were cases of disease associated with parainfluenza virus, Epstein-Barr virus, mycoplasma, and escherichia. You can not exclude the presence of a hereditary predisposition to the development of the Still's disease. But the final results confirming the relationship of the disease with the loci HLA, have not yet been received. Immunological theory, which relates Still's disease to autoimmune diseases, is confirmed only in some cases when patients have CECs that determine the development of allergic vasculitis. Fever in Still's disease is distinguished by a rise in temperature to high figures (39 ° C and above). Unlike most infectious diseases, it is not permanent. The most typical one-time rise in temperature during the day, usually in the evening. Less frequent are 2 temperature peaks per day. In most patients, the temperature between the peaks decreases to normal numbers, which is accompanied by a significant improvement in the general condition. Approximately 20% of patients with Still's disease do not normalize body temperature. Eruptions in the Still's disease, as a rule, arise at the height of the rise in body temperature and are of an incoming character: they disappear, they reappear. Elements of the rash are mostly flat pink spots (maculae) or papules located in the proximal parts of the limbs and on the trunk, less often on the face. 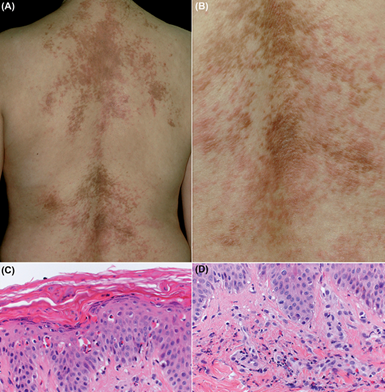 In 30% of the cases, Steele disease rises above the general surface of the skin and occurs in places of trauma or compression of the skin (the phenomenon of Kebner). Sometimes they are accompanied by itching. The pink color of the rash, its periodic disappearance and the absence of subjective sensations often make the rash invisible to the patients. In some cases, the doctor has to examine the patient immediately after a warm shower or resort to thermal effects on the skin, for example, by applying warm wipes to detect a rash. There are atypical skin manifestations of Still's disease: petechial hemorrhages, erythema nodosum, alopecia. Articular syndrome. Arthralgia, along with myalgias, at the onset of Still's disease is attributed to general manifestations of the disease, caused by a high temperature rise. At the initial stage, arthritis can affect only one joint. Then the lesion takes on the nature of polyarthritis involving the ankle, knee, wrist, elbow, hip, temporomandibular, interphalangeal, metatarsophalangeal joints. The most typical of the Still's disease is the development of arthritis of the interphalangeal distal joints of the hand. This feature allows you to differentiate the disease from rheumatoid arthritis, rheumatic fever, systemic lupus erythematosus, which is not characterized by the damage of these joints at a young age. The defeat of lymphoreticular organs includes hepatosplenomegaly and lymphadenopathy. Lymphadenitis is observed in 65% of patients with Still's disease. In half of cases of the disease, there is an increase in cervical lymph nodes. The enlarged lymph nodes in Still's disease retain their mobility, they have a moderately dense consistence. The expressed compaction of the lymph node, its isolated enlargement or adhesion to surrounding tissues should be alarmed oncologically. In atypical cases, lymphadenitis can take a necrotic character. In an acute period for 25% of patients, it is sufficient to prescribe drugs from the group of non-steroidal anti-inflammatory drugs. Their reception, depending on the clinic of the disease, takes from 1 to 3 months. Changes in the heart and lungs are an indication for glucocorticosteroid therapy with drugs of prednisolone or dexamethasone. However, these drugs do not always have a sufficient effect. In the chronic course of the Still's disease, methotrexate may be used to reduce the dose of corticosteroids. The preparation of the reserve for patients with severe forms of the disease can be cyclophosphamide. In some cases, resistant to the traditional treatment of cases of Still's disease, it is possible to use infliximab and etanercept.